The Seven of Swords appearing in your Reading generally highlights Mind Games but it depends on surrounding Cards as to whether this is helping or hurting your situation. Being resourceful, thinking on your feet and trying to outsmart your opponent or competitor is part and parcel of everyday life and there are times when we all have to try to get into someone’s head to find out what it is that makes them tick. Sports people do it constantly. If they didn’t they would never get a chance to out-beat or overturn their reign of success. They spend a long time getting to know their opponent by watching and analysing their tactics so that they can go out and play a psychological game along with the physical. Those in Marketing and Sales do likewise and of course we see Mind Games being played out constantly in the Courtroom . The Seven of Swords suggests that you might be doing that or need to and it does not necessarily imply that you are going out to play a game of rugby or golf. You are in a situation at present that requires you to be super alert and smart. Those around you and involved in your situation are very clever and intelligent. You need to be too in this instance. You must start analysing the facts using logic and reason before coming up with some sort of plan that will put you out on top. It needs to be something that they haven’t thought of or better still, something they never thought you would come up with. You may not think that this is possible but you need to start believing in yourself. You may see the other side as being way ahead of you and that they have held all the power in your situation. You more than likely have suffered defeat to them in the past which has dis-empowered you. The thing is, they think you are dis-empowered too for they hold all your Swords. This could be their downfall for they underestimate you. Their guard may be down as a result. You making a comeback or threat is the furthest thing from their mind right now. You have the upper hand now and need to make your strike before they wake up to what you are doing. You need to come up with a brand new strategy and game plan, then come at them from their blind side. They won’t see it coming and they won’t believe you have it in you but with careful effort on your part you can prevail. Time to use your head and think on your feet. 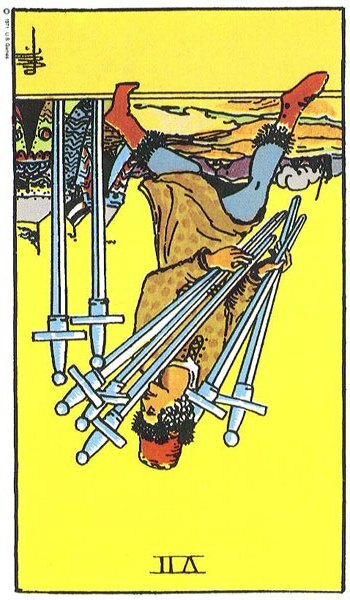 In this Card we see Two Swords left plunged into the ground. The man cannot carry them all but even though he may plan to come back for them later, he is not too concerned as he believes he has the most important ones. The Two Swords are your secret weapon and now it is up to you to discover just exactly what that is. You need to use all your resources now and carry out much research. Others have been in your situation before so you might learn a thing or two about how they overcame similar challenges. Scour the internet and read up on as much as you can. Make yourself as informed as possible and look to see how others are doing things. They may have some wonderful ideas that you could incorporate into your project or mission. Use them as an inspiration but do not completely steal their ideas. You have what it takes, you just don’t realise that right now. It shows that you may be making a comeback after a major defeat or setback in your life. This Card shows your ability to rise from the ashes. The opportunity has presented itself to you and you would be a fool not to seize it. Grab those Two Swords and put them to work. The Seven of Swords often appears when you need to do something that requires you to be brave and courageous. It brings with it the message of don’t give up. If your attitudes, plans and approach have not been getting you the desired result then change them. Use your initiative. Find another way to get what you want but it might involve taking risks or being daring in your approach to a situation or person. You may be unsure as to whether you have what it takes but you must do what is necessary. Now is not a time to be in two minds. You must be focussed, adaptable, resourceful, flexible and prepared to make your move when the Seven of Swords appears. When the Seven of Swords appears it can suggest that now may not be the best time to share what you know with others or give too much information away. Unfortunately, you may not be able to trust those around you as you think you should. Rely on yourself right now and be as self-sufficient as you can. If you have a secret, the less people know the better as what you say may be misconstrued, misinterpreted or leaked. There is a possibility that you could be betrayed by someone you know or be at the receiving end of manipulation and deceit. Lies and underhand behaviour could be going on under your nose and with the Seven of Swords, it generally is someone you wouldn’t expect. This behaviour will not be out in the open but there is bound to be plotting and scheming going on in the background. Open your eyes and mind and observe closely what is going on around you and who is involved. The Seven of Swords often brings the message of ‘know your friends, but know your enemies even better’ or ‘keep your friends close and your enemies even closer’. These are your secret weapons. In this way, you will not floored by any sudden surprises and it gives you the advantage when issues or challenges occur which involve them. You must beat the enemy at their own game so keep yourself ahead of the posse at all times. The Seven of Swords carries a warning of possible theft or criminal activity. Make sure your house, car and possessions are secure. Check alarms and security locks. There might be a thief around and if you have not taken precautions he just might get away with it. Theft can also come from close quarters and in a situation that you would not expect. Someone may be trying to involve you in a scam or con. You need to be more on your guard, watch your back and be a little less trusting. Whoever it is, is very clever and cunning. They are bound to cover their tracks and will be far away before any discovery is made. They may also leave you holding the blame. In a Relationship Reading, The Seven of Swords can suggest that you are finding new ways to communicate and revive a troublesome relationship. By hanging on in there and spending time adopting new approaches and ideas, the relationship revives. You may see your relationship as incredibly tricky and complicated or that it keeps you constantly on your toes. You may be trying to organise a surprise birthday party for your partner and are enjoying all the intrigues and secrecy involved. There is a danger that someone will leak the surprise, so limit as much as you can those who know. Unfortunately, the overriding meaning for the Seven of Swords in a Relationship reading suggests deceit and unfaithfulness. This Seven can bring secret love affairs, sneakiness, hidden truths and betrayal. You may very well have an enemy in the camp. Look for other Cards such as the Three of Cups Reversed for a third person in the relationship as one partner may be having an affair. Other Cards that would tie in with this are the The Three of Swords, The Moon, The Lovers Reversed and Reversed Court Cards. There could be evasiveness and secret rendezvous or false names given in hotels as they travel incognito (check to see if the Six of Swords is around also!). Trust is broken. A partner could take off without notice, leaving you high and dry and carrying the can for their bills and debts. The Seven of Swords can also suggest eloping or running away together as a couple if your relationship is disproved of. Then again, you may prefer to avoid relationships altogether. You could enjoy your own company and revel in solitude. You may not feel the need for a partner in your life and prefer to be independent. You just don’t the need the company or baggage of others and keep yourself to yourself. You might be the type who does not like the neighbours knowing your business or keep things from your family and friends for fear of gossip and speculation. Others may see you as a bit of a lone-wolf, someone who is always going it alone and very self-reliant. This can often annoy people who are generally nosy and intrusive. They may see your need for privacy as stand-offish and unfriendly. Spending time alone or single is healthy for all of us at times and many people could benefit from periods of solitary existence. However, we must not totally isolate ourselves from others and forget how to be social and mix. Your partner may also be stealing from you or lying. They may even be involved in criminal activity and the movement of illegal or stolen goods. Do you really know and can you really trust who you are involved with? He or she can be very manipulative and persuasive. However, the Seven of Swords in a Relationship Reading may simply imply that you or your partner is involved in the military or police force. Dawn raids and dangerous missions may be part of their daily work. They could be working undercover or carrying out investigative work which involves them having to be very secretive with the details. In a Career Reading the Seven would suggest that you will have to be very resourceful and think on your feet if you wish to succeed in your career or job. Playing safe will get you nowhere this time. If job seeking, then create a really unusual CV and approach to get you noticed. Time to stop doing what everyone else is and stand out from the crowd. There may be a lot of office politics and hidden agendas in our work environment Work colleagues could be two-faced and not averse to talking behind your back or stealing your work. There may be some nasty business going on around you in the workplace. Someone may be attempting to blame you for a mistake in work that they are responsible for. They will have covered their tracks well so will be hard to nail down. If in Business you might have been using the same old approach which is now proving to be stale and outdated. It might be time to look at how the successful competition do things. You might learn a lot. You might be able to put a few of their ideas together and make it yours. You may need to update your technology or install some state of the art computers that no one else has yet. You need to be doing something that your competitors aren’t. It is all about pulling information and ideas from wherever you can to come up with a new game plan. Time to be resourceful, flexible and adaptable in business. ‘The early bird catches the worm’ . You may also be running with an idea that isn’t workable but only needs a bit of adjustment here and there to sort it out. On a more cautionary note, you may need to be more alert or on guard in business. How well can you trust those you delegate to. There may be underhand business, theft or covering up that you are unaware of. It is time to double-check business and bank account as something may not be quite right. Also check your suppliers and their credentials or you may end up purchasing stolen goods or there could be discrepancies in your deliveries. You business may also involve a lot of mental activity, thinking on your feet and communication. You might be coming up with an intriguing plan or idea. You could be creating or installing important security software to safe guard confidential information from theft and hackers. 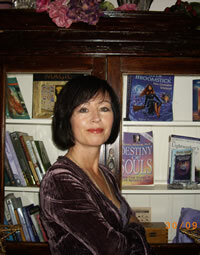 As a writer, you might be working on a psychological drama or crime novel. You may be involved in undercover work or the military. If working on a project or plan it may be time to go back to the drawing board to explore new ideas and strategies. Going with the same old approach could prove stale and outdated. When the Seven of Swords Reverses it is time to Let Go or Stop Hanging On. You are getting nowhere with what you are doing, so you need to put whatever you have in your hands down and step away. The key here is to have a good think about what you are doing for you will find a solution if you give it some thought. It can suggest that you are holding on to old ways of doing things and getting pretty much the same unwelcome result each time. You might be carrying out-dated or outmoded ways of thinking and acting, but find it very difficult to let go and change regardless of any good intentions you have. Fear of taking a risk or the unknown holds you back. You may not have the guts or back bone to follow through on new ideas or plans and keep reverting back to the old way of doing things. It is time to stop and let the new ways in. Be open to change and novel approaches. The Seven of Swords Reversed can suggest that you are running with an idea that won’t work. You haven’t thought it through properly and are acting impulsively. You need to stop in your tracks now and go back to the beginning as parts of your plan need to be either dumped or re-worked. It may feel that you don’t have the time to do all that and intend to keep running in the hope that it all works out but you are only setting yourself up for delays, set-backs or complete failure. You may want to get your ideas off the ground before someone else does. Slow down for you are not looking where you are going. Then again, you could be playing safe in a situation and not putting all your eggs in one basket. You may be prepared to go along with new ideas and plans but only up to a certain point. You will not be giving your all to this as you simply haven’t made up your mind yet. The divided Swords the Figure carries in this Card suggests being in two states of mind about an issue. The fact that the Figure looks back to the two remaining Swords implies that he has not fully committed and has left him self an opt-out clause. This could also suggest experiencing a ‘cooling off’ after embarking on a course of action. You don’t seem to be fully convinced about what you are doing. In the Seven of Swords Reversed you may be taking advice from those around instead of doing what you think is right. Part of you knows this but you can fall under pressure to comply with the majority. On the other hand good advice or a warning goes unheeded and you continue to proceed in a manner that may ultimately have disastrous consequences. Looking to yourself may not be the best idea at present for you may not know what you are doing. This Card Reversed can suggest that you have been outsmarted by someone else. You are not in their league at all and have had little chance to gain the upperhand or advantage. Their mind is razor sharp and possibly quite devious. Mind Games and phsycological warfare is how they operate and unless you can match that then it may be time to back out before they completely destroy you. It takes a certain type of personality to overrun this person. You may not have what it takes. The Seven of Swords Reversed brings sly, cunning and devious behaviour much worse than the Upright Version. Trust is impossible and you may be shocked when you discover the level of lies, cover-ups and secrets that have been going on around you. You must now be on your guard against being told another load of lies in an attempt to manipulate the truth. Whoever, this person is, and it may be you that I am referring to, they are prepared to do anything they can to wrangle their way out of the blame. One thing they don’t want is to take the rap and there is a good chance they will have fled the scene or disappeared before you had wised-up to what was going on. This person has caused a lot of trouble but has left others to clean up the mess. They have no conscience and no remorse. Take a good look around you as there may well be someone taking advantage of you. 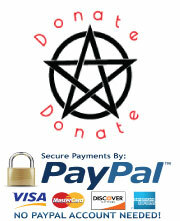 You may discover that you are the victim of a scam or con. The Figure in the Reversed Seven of Swords appears to be walking on the ceiling or roof. If he is a thief, he may have got in through an area you thought was inaccessible. The Two Swords stuck in the ground can represent a tiny skylight or narrow opening. Theft and break-ins are more likely when this Card Reverses. The thief this time is very devious, daring and extremely clever so make sure you double-check all security alarms and locks. If theft is involved, the thief may have left something at the scene of the crime and may try to return to retrieve it or possibly come back for what he could not carry the first time round. On the other hand, as with all Reversed Cards, we can have the extreme opposite. We can therefore see someone coming clean about what they have been up to or involved in. Their conscience may have been bothering them and know that what they have been doing or what has been going on is wrong. If this happens, the whole truth will come out and there may be many surprises at the level of involvement of people you may have seen as friends. One way or another, trust is blown out the door regardless of apologies and regret. You may wonder if you were the only one who wasn’t in on it. There is a possibility that a situation or person from your past has caught up with you and could be threatening to destroy a new life you have made for yourself. You may be trying to conceal it by meeting secretly and keeping the problem to yourself. There may be blackmail or threat of exposure involved. This can leave you feeling dis-empowered and out of control. You could be backed into a corner and feel there is no way out. If organising a surprise party then you may be surprised yourself by their lack of surprise. Someone may not have been able to keep the secret to themself. The Seven of Swords Reversed can imply that you have a tendency to avoid danger or take risks at all costs. Cowardly and weak, you may have a habit of running away when the going gets rough. You could shirk responsibility and just disappear leaving others to face the music. You could feel an obligation to no one other than yourself and will take the easy way out when and wherever you can. Where Relationships are involved this is a very disruptive Card. It can suggest that an affair is uncovered or revealed. You may be the last person to hear about it as you discover that friends and work colleagues have known for some time. There can be a feeling of disbelief and horror as details of the affair are disclosed. Secret meetings, travelling and bookings under false names go with the territory. The third-party involved may even be someone you know very well or has been close to you. The affair may have been going on under your nose for a long time. Illicit love affairs and elopement accompany the Seven of Swords Reversed. There is the possibility of your partner disappearing or running off with their Lover. Instead of coming clean and facing the fall-out, they have taken the easy way out and scarpered. The sooner you let go of this relationship the better for trust is broken and is unlikely to return. There is also a possibility that the third person in the relationship may have left something behind where they shouldn’t and need to retrieve it (an earring in a car, a bottle of perfume down the back of a couch, need I go on?). If discovered by you, then your partner will have made up an elaborate story as to how it innocently got there. However, with the Reversed Aspect we may on occasions find that the Card represents remorse and regret once an affair has been revealed. Truth and honesty replace secrets and lies. Steps may be taken to make amends or get help. Then again, you may choose to ignore or disregard a warning about your partner. You may be guilty of turning a blind eye to their carry on or refuse to face the truth. You partner may have had you fooled for some time. He or she may have even stolen from you or conned their way into your life. Work-related, The Seven of Swords Reversed can point to dishonesty in the workplace. Someone may lack confidence and know how, so resort to manipulation and underhand scheming to get what they want. Back stabbing and sheer nastiness can make the work day a nightmare. Someone may have it in for you and are making your life miserable. They may be spreading malicious gossip about you. Intellectual theft and taking the credit for someone else’s work are trademarks of the Seven of Swords Reversed. Be very careful who you share you work ideas with for they might not be trustworthy and try to pass them off as their own. Make sure to Copyright your work. This Reversed Card describes a scenario a Client of mine experienced not too long ago. She had been all enthusiastic about a business idea she had and of course could not talk of anything else among her friends. She had picked out the name for her business and had started to build a website. She had business cards designed and leaflets printed. When she went to register and launch her business she discovered to her horror that someone had got there ahead of her. Same idea, same name, even the same layout and wording for the brochures. She was even more horrified when she discovered that the person behind it was one of her circle of friends. She had to go back to the drawing board and start a whole new business idea. The brochures and business cards had to be dumped as they were no longer of any use to her. She had already invested much money with web designers and took quite a hit financially. She couldn’t believe that a friend would do that to her. However, she learned a lesson, an expensive one. She kept her new business to herself and was very careful as to who she trusted. The Seven of Swords both Upright and Reversed suggests theft and here we find the computer hacker, the thief who will steal you identity and clear your account. He may just as easily infect it with a virus. You could stand to lose all your information or have confidential files leaked. You must take steps to ensure that all anti-virus software is up-to-date. Be very careful who you give access to and to where you keep your passwords. Now might be a good time to up-date all your passwords. You must also be careful about idle gossip or comments at coffee or lunch break as it may not be kept in your group. You may get into trouble as a result. In this scenario there is usually a ring leader who uses and manipulates all those around him or her. It may be time to look for a new job. Dishonesty in the work environment and illegal business. If you have made a disastrous mistake you may try to sort it out but you may also be discovered or caught and the truth will out. You must decide whether it would be wiser in the long run to confess and get it over and done with rather than all the sneaking around. Likewise if you discover corruption in the workplace, you may be in two minds as to what to do about it. Should you be the whistle-blower or turn a blind eye? This Card aptly represents the current scandal of horsemeat being found in foodstuffs all over Europe. People have been buying meat products that are supposed to be beef but have tested positive for horsemeat instead. A massive investigation has been launched and meat products cleared from shelves. The investigative forces are now looking to criminal activity behind it all. Major stores have been effected. Innocent people are bound to lose their jobs as the consumer loses trust in their company’s products. The criminals have no conscience and we must all presume that they were making big money out of their illegal venture. 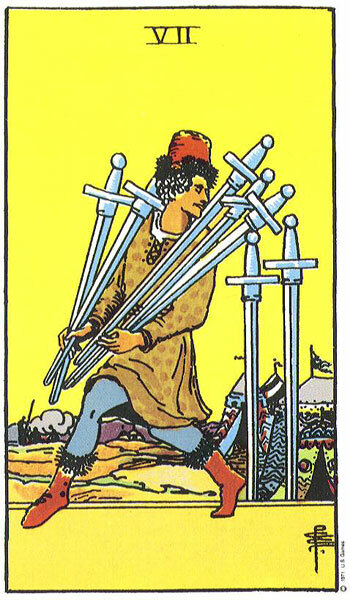 Typical Seven of Swords activity. In Business, you may be refusing to move with the times and have become old-fashioned and outdated. You could be trying to push a business that is not viable. Time to let go. There is no point in hanging on as what you are doing is not working. You may have failed to take good business advice or have delegated to the wrong people. Time to take a good look at your business to see what has been going wrong. Be extra cautious and on your guard at business meetings or when signing contracts. Read all paperwork thoroughly, especially the fine print . Career wise you may be training undercover or in the military, doing undercover or detective work. You might even be a spy. You might work in a dangerous environment which requires you to be daring or take risks. Vivien. Do you think the 7 Of Swords could stand for the Isis terrorist group? I know in your definition you describe the 7 of Swords as a lone wolf but also the military . Any thought would be appreciated . Oh very definitely yes. A lone wolf, from the point of him carrying out a solo operation of subterfuge. Military when we take a look at the soldiers camped in the background. Terrorist activity for sure either as a lone wolf, cell or network. They do not operate out in the open like the official army depicted but must sneak around to carry out their business. No one suspects a thing and therefore is caught off guard when they launch their attack. The may have terrorist infiltrators in the camp, terrorist plants or sympathisers that facilitate their operations. I have come across a funny meaning for this card – plagiarism. It was combined with the Devil in my reading…. Yes, I have seen that before. The Seven of Swords often advises you to look at what others are doing to get ideas. Ideas only, not copy it and call it your own!! !